Avascular necrosis (also known as osteonecrosis, bone infarction, aseptic necrosis, ischemic bone necrosis and AVN) is a condition where bone tissue dies due to a lack of blood supply. This decrease in blood supply causes a decrease in oxygen and nutrient delivery to the bone, which leads to multiple breaks in the bone and eventual collapse of the affected bone. This condition is most common in younger patients who are between the age of 20 and 40. See Avascular necrosis of the femoral head and Hip Avascular Necrosis for joint-specific information. The proximal area of the femur forms the hip joint with the pelvis. It consists of a head, neck and two bony processes called trochanters. There are also two bony ridges connecting the two trochanters. • Head: Articulates with the acetabulum of the pelvis to form the hip joint. It has a smooth surface with a depression on the medial aspect for the attachment of the ligament. • Neck: Connects the head of the femur with the shaft of the femur. It is cylindrical, projecting in a superior and medial direction. This angle of projection allows for an increased range of motion at the hip joint. • Trochanter Major: A projection of bone that originates from the anterior aspect, just lateral to the neck. It is angled superior and posterior. A place of attachment for different muscles in the gluteal region, such as M. gluteus medius, M. gluteus minimus and M. piriformis. Avascular necrosis can be a result of an earlier bone trauma (such as a break in the bone) or a dislocation. Numerous studies have also concluded that hyperlipidemia in the femoral head, induced by steroid and alcohol use, are associated with osteonecrosis. Both of these factors precipitate an increase in fat volume in bone marrow and blood lipid levels, thereby increasing deposition of fat and interrupting blood flow to the femoral head. Glucocorticoid intake was found to have an even stronger association than alcohol use. Obesity: osteonecrosis is positively associated with BMI. Overweight and obesity are, just like steroid and alcohol use, often associated with hyperlipidemia. A medical condition, such as sickle cell anemia or Systemic Lupus Erythematosus. Symptoms include pain and decreased range of motion in the affected joint. In some cases, the condition is diagnosed during routine x-ray imaging, due to a lack of overt symptoms. The most common location for this condition to manifest, is the head or neck of the femur or humerus, and the knee joint. In the beginning, this disease is asymptomatic. It is also plausible there is a segmental collapse present and the patient doesn’t feel it. As the disease progresses, the hip can become stiffer, which is visible in the gait of the patient when he starts to limp. Pain is also observed by support on the leg, in the buttock, groin and thigh. Stage 1: Radiographic changes are absent or show minor osteopaenia. An MRI scan is required for identification (can show oedema). The onset of this disease is asymptomatic. Stage 2: First stage with radiographic changes. This stage is characterized by sclerosis of the superior central portion of the joint head and/or osteopenia and/or subchondral cysts. Stage 3: In this stage, the articular surface is depressed so that the round contour is compromised, without being significantly deformed. This leads to a joint space narrowing. Plain radiograph shows a crescent sign. Stage 4: This stage is characterized by a wide collapse of the subchondral bone and destruction of the underlying trabecular pattern. This can lead to secondary arthritis. Stage 5: The final stage where both articular surfaces are affected, which leads to a dysfunctional joint. Osteonecrosis can be diagnosed with a thorough check of the historical background of the patient combined with physical examination. Steroid exposure and alcohol abuse are important risk factors. The age of the patient can also provide clues to the disease, because patients with osteonecrosis are generally younger than those with osteoarthritis. Locking, popping, or a painful click during mobilization of the affected joint can point to the presence of loose osteochondral fragments. In further stages of the disease, loss of mobilization and increased pain can be detected. Once osteonecrosis is detected, the physician should assess other joints that may be at risk, such as the hip, shoulder and knee. At a more advanced stage, standard radiographs can confirm the diagnose. Tissue affected by avascular necrosis will appear more dense (increased whiteness) and possibly sclerotic (patchy) on the radiograph. An MRI can assist in making the diagnosis. It can show a subchondral radiolucency called a “crescent sign”, it indicates imminent articular collapse. Choice of outcome measure will be dependent on the joint affected. If the patient reports symptoms of pain, consider a pain rating scale such as the 4-Item Pain Intensity Measure (P4), Numeric Pain Rating Scale, or Visual Analogue Scale. The pain domain: measures pain severity, its effect on activities and the need for pain medication. The function domain: consists of daily activities (stair use, using public transportation, sitting, and managing shoes and socks) and gait (limp, support needed, and walking distance). Deformity: takes into account hip flexion, adduction, internal rotation, and extremity length discrepancy. Range of motion: measures hip flexion, abduction, external and internal rotation, and adduction. The HOOS assesses the patients’ opinion about their hip and other associated problems. People that suffer from hip disability with or without osteoarthritis can use this scale. A functional outcome measure is useful for establishing the patient's baseline function and setting measurable goals. See Outcome Measures Database for more. 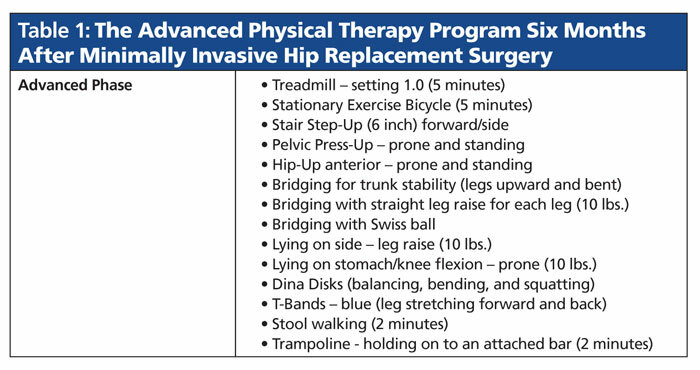 When all other things fail, a total hip arthroplasty (commonly in stages 3 and 4) is the only option. In this total hip replacement the damaged bone and cartilage is removed and replaced with prosthetic components. • The damaged femoral head is removed and replaced with a metal stem that is placed into the hollow center of the femur. • The damaged cartilage surface of the socket (acetabulum) is removed and replaced with a metal socket. • A plastic, ceramic, or metal spacer is inserted between the new ball and the socket to allow for a smooth gliding surface. Appropriate treatment for avascular necrosis is necessary to prevent further deterioration of the joint. If untreated, most patients will experience severe pain and limitation of movement within two years. Although physical therapy cannot cure avascular necrosis, it can slow down the progression of the disease and decrease associated pain. It is suggested that patients with Stage 1 and 2 osteonecrosis could benefit from a physical therapy program. Most patients will eventually need surgical treatment, such as core decompression or arthroplasty. Nonoperative treatment begins with patient education and addressing known risk factors, such as smoking and alcohol abuse. In addition, corticosteroids should be avoided. To assist the patient in regaining function and relieve painful symptoms, crutches or other gait aids can be introduced. The physical therapist should instruct the patient in how to properly use these devices. Physical therapy treatment focuses on exercises to maintain joint mobility and strengthen the muscles around the affected joint. During physical therapy, excessive compressive and shear forces on the joint should be avoided. The outcome depends on the lesion’s size and stage at the initiation of the treatment. Gruson K, Kwon Y. Atraumatic osteonecrosis of the humeral head. Bulletin of the NYU Hospital for Joint Diseases 2009;67(1):6-14. Lee MS, Hsieh PH, Shih CH, Wang CJ. Non-traumatic osteonecrosis of the femoral head – from clinical to bench. Chang Gung Med J 2010;33(4). Huijbregts P. Osteonecrosis of the humeral head: a literature review and two case studies. J Man Manip Ther 2000;8(4):175-182. Hasan S, Romeo A, Nontraumatic osteonecrosis of the humeral head. J Shoulder Elbow Surg 2002. ↑ 1.0 1.1 1.2 1.3 1.4 1.5 1.6 1.7 1.8 Gruson K, Kwon Y. Atraumatic osteonecrosis of the humeral head. Bulletin of the NYU Hospital for Joint Diseases 2009;67(1):6-14. ↑ 3.0 3.1 3.2 Lee MS, Hsieh PH, Shih CH, Wang CJ. Non-traumatic osteonecrosis of the femoral head – from clinical to bench. Chang Gung Med J 2010;33(4). ↑ Magee DJ. Orthopedic physical assessment. Saunders:St Louis, MO, 2008.